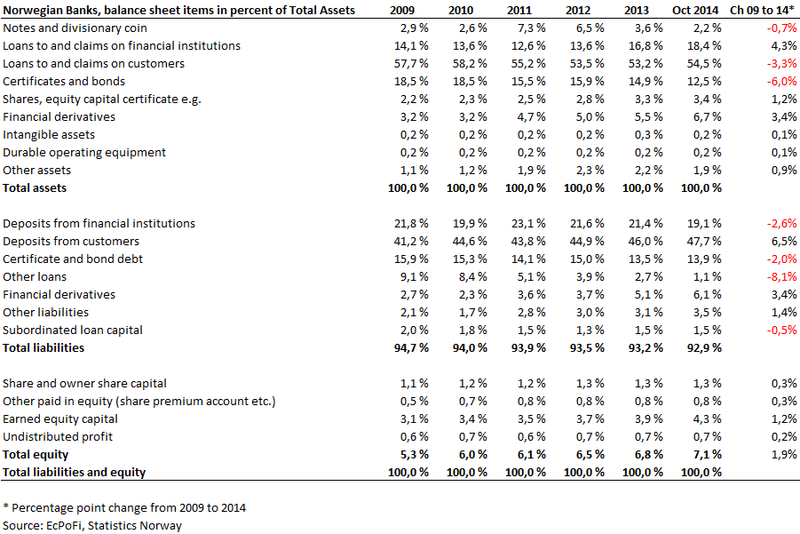 Statistics Norway recently published the aggregate balance sheet for banks operating in the country. As usual, it makes for bleak readings for anyone concerned about sound and sustainable economic growth and financial stability. 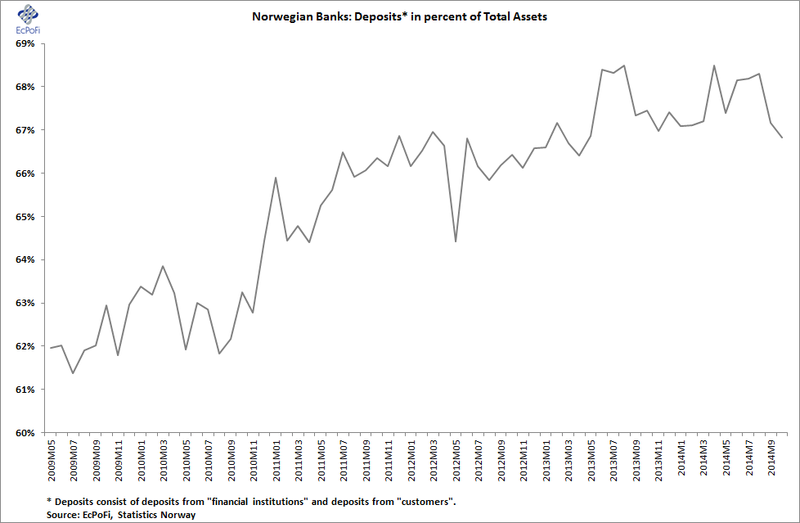 Despite much focus on weak bank balance sheets in the aftermath of the 2008 financial crisis, bank balance sheets in Norway (and other countries) remain highly leveraged and are to a preposterous extent financed by the very deposits they are supposed to keep safe. It is not unusual for banks to finance a high proportion of their assets with depositors' money. This is simply a feature a fractional reserve banking. In fact, this very measure was more than a percentage point higher for U.S. banks as of October. 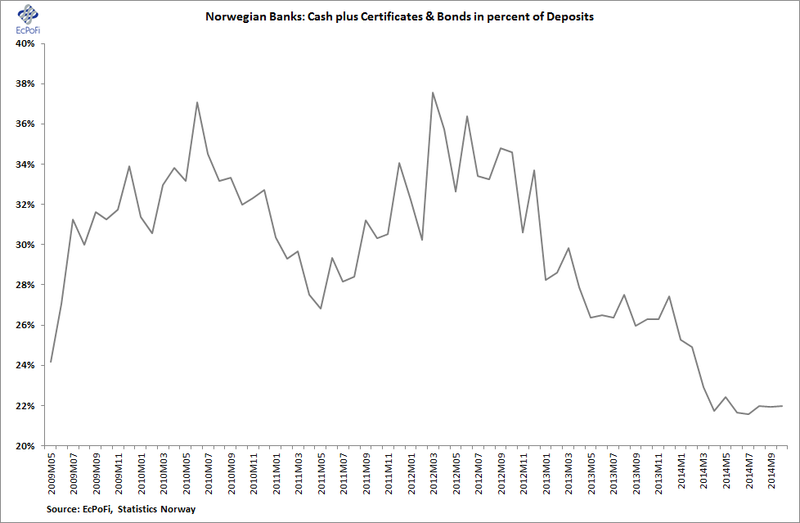 Against these deposit liabilities of Norwegian banks, cash plus certificates and bonds cover currently only 22%. For U.S. banks, this ratio stood at more than 48% in October. Furthermore, while any semi-prudent run non-bank large business would typically finance perhaps something like 30% of its balance sheet with equity, banks are very different. 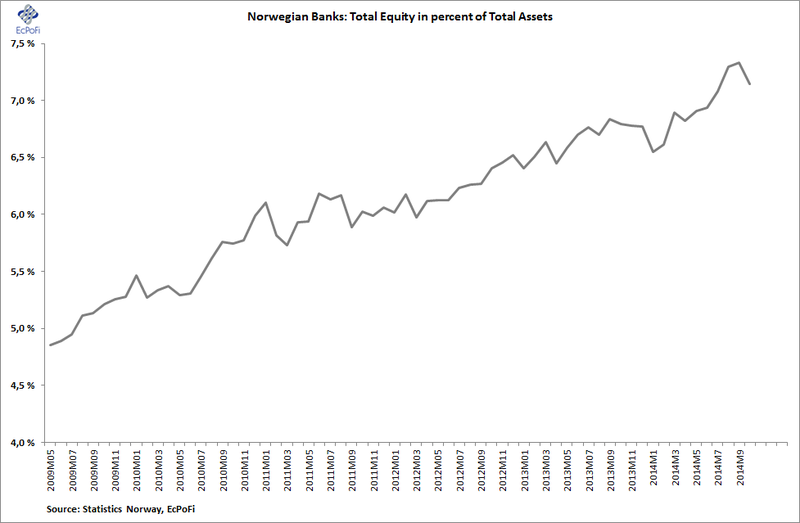 Currently, Norwegian banks are financed by a minuscule 7.1% in equity, significantly lower than the 10.75% for U.S. banks in October. Herein lies a great source of risk to the Norwegian economy: Norwegian banks are so poorly capitalised it does not take much imagination to see banks run into financial problems. But banks will endure as Norges Bank will promptly act to prop up bank balance sheets with taxpayer money during the course of financial crisis. That is why banks are able to be so poorly capitalised and hence take on so much risk which, after all, is the primary reason for financial crisis in the first place. If the Norwegian government and Norges Bank (the central bank) are actually concerned about "financial stability" then requiring banks to substantially increase equity capital is the only natural starting point.